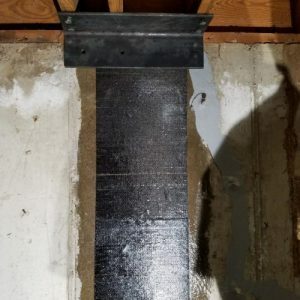 It used to be that the only way to fix bowing or structural cracks in a basement wall was to put up a steel I-beam, anchored to the wall to hold it in place. 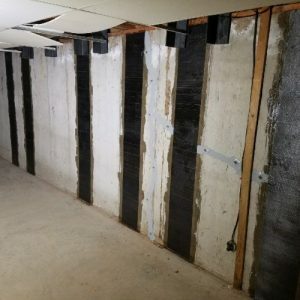 Not only was it an eyesore that had a big effect on the resale value of your home, but it also took up quite a bit of space if you were planning on finishing your basement. Now, through technological advancements, carbon fiber straps can be used instead that are far superior to their steel counterparts. Carbon fiber is a miracle material that is so strong and lightweight it’s used in automobiles, bicycles, airplanes, medical equipment, and even the space shuttle! When fixing foundations, we use the best method to suit your situation so the job is done right the first time. For foundation walls that are bowing in or have large or “staircase” cracks (they’re cracks that follow along with the mortar between your cement bricks in a staircase pattern), carbon fiber is usually the best and most cost-effective solution. And the best thing is, it’s a permanent one. After the wall is pushed back into place, the carbon fiber is applied in 1 foot wide by 2 feet long strips, after we grind down the area where they’ll be applied and roll on the expo bonding paste that will hold them in place and to make the carbon fiber strips rigid. They have such a low profile, you can mask them by simply painting over them. They’re so strong that once the repair is done, you never have to worry about those cracks again. They will permanently stabilize your wall. Carbon fiber strips are a no-maintenance product. Once we’ve applied them to your foundation wall, you’re done! 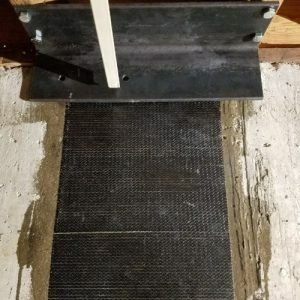 The technicians at Adams Foundation Repair are experts at foundation repair and carbon fiber installations. We are 100% OSHA complaint which means when we come into your home to do the repair, we set up HEPA filters to prevent harmful dust buildup because your family’s health and wellbeing are important to us.